I don’t think I have a high enough brain function to ever fully understand everything that was going on in “Interstellar.” And that’s how you know you’re watching a great Christopher Nolan film: the amazing visuals outweigh the technical jargon and perplexing plot elements. My best approximation for describing “Interstellar” would be a cross between “Contact” and “2001: A Space Odyssey” filtered through “Inception.” Ok, so it’s basically “Inception” in space without the whole heist thing. It features crazy, top-notch photography, great performances from its Oscar alumni-heavy cast, and a fascinating story that seems to be polarizing audiences everywhere. No doubt about it though, this is a film worth seeing on the big screen and discussing for days on end. The basic premise of “Interstellar” (which originally had Steven Spielberg’s involvement) isn’t anything particularly new. In the near future, Earth is no long able to provide a place for people to live. Dust storms ravage the land and people are forced to eat nothing but corn-based products. And like all great sci-fi films the only hope is to explore the possibility of leaving Earth and finding another place that can sustain human life. Enter Cooper (Matthew McConaughey) a former NASA test pilot who lives on a farm with his teenage son, young daughter Murph, and his father (John Lithgow). Murph believes some kind of “ghost” is haunting her, leaving a Morse code message which turns out to the coordinates of a top secret NASA facility where a mission to explore other galaxies in the hope of either transporting the Earth’s population or Plan B: repopulating a new planet with fertilized eggs leaving everyone on Earth to eventually die. The scientists have discovered a wormhole near Saturn, which they believe was placed by otherworldly beings, which would therefore make traveling such a far distance feasible. The film’s setup is simple enough. Cooper is distraught about leaving his family behind, especially Murph, but he chooses the space mission in hopes that he can one day, even years in the future, return to his family on Earth. He’s joined by Dr. Brant (Anne Hathaway) and two other crew members, in addition to AI robots one of which is named TARS. Jessica Chastain plays Murph as an adult and the film spends much of its duration cross cutting from the devastating moments on Earth with the intense space sequences which are sometimes just as devastating. To say anything else about Jonathan Nolan and Christopher Nolan’s sometimes hokey script would ruin the fun. But let’s just say the film – like “Inception” – has a fun time playing with the concept of time and how in this film’s case, time is relative to your location in the galaxy. It’s certainly an audacious concept, and while one could easily find it farfetched, I really dug it. Most of these elements are based on real scientific fact and theories at least. It’s really the film’s final act that is most divisive as the film becomes truly bizarre and “out there.” But if you can make sense of “2001” then this film should go down easily enough. The real reason any film fan wants to see “Interstellar” is for its amazing - non-3D - visuals. The cinematography is simply stunning. Nolan’s longtime DP was busing making his directorial debut and critically trashed “Transcendence” and was replaced by “Let the Right One In” cinematographer Hoyte van Hoytema who shot a lot of scenes with IMAX cameras, one of which was reported mounted onto the tip of a Learjet. The sound design is appropriately loud and intense, though like last year’s “Gravity,” the film plays a lot with the fact that there is no sound in space. And Hans Zimmer provides another terrific score, not quite as bombastic, he was definitely going for something different here with some almost 80s sounding music queues that fit the visuals quite nicely. 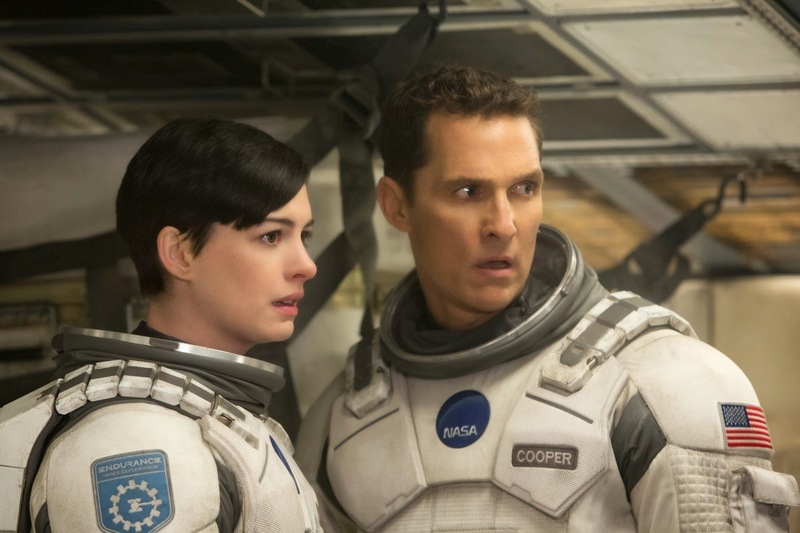 Theatrical Trailer for Interstellar on TrailerAddict.